I have a few months’ buffer on these comics, so I actually was penciling this page on slow days at work over the summer (I work for the government, so make of that what you will). Normally when I draw at home I play music the whole time, but I wouldn’t do that during my breaks at work, for obvious reasons. Instead I just made up elaborate backstories and names for all of Louis’s classmates. The only interesting one I decided was that the girl with blonde hair in the front with Archie – Lydia, whose name was briefly mentioned on Page 11 – is Archie’s cousin, hence their similar appearances and why they’re huddled up looking a bit gossipy in this scene. I have no cousins my same age, but I hear that can generally be the interaction, so I put it in. Mrs. Bridgman’s disdain for Mrs. Cooper’s notes is both a funny way of setting up the upcoming scene’s premise and…poking a little fun at art school. When I went on field trips to museums in school, we always had some odd sort of sketch assignment that most people wouldn’t really complete. We mostly wanted to take in the art without feeling beholden to interacting with it in a specific way. I still feel this way – I just wanna see the art on my own terms, not a teacher’s! I can't believe your write backstories even for minor characters! That is dedication. Also, you've created a well thought out, gorgeous color scheme. Call it dedication or call it overthinking-and-boredom, but yes! I guess growing up with very detailed book series (like Terry Pratchett's Discworld) led me to favor that sort of world-building. Thank you! Hey, I've been following since the very beginning, and have been really enjoying LoF. 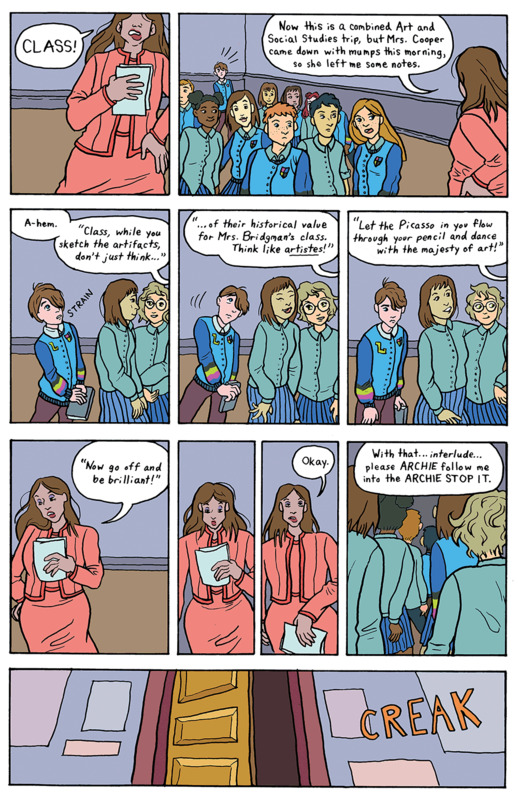 Your art style (for this strip) reminds me of a young Bill Willingham, especially in the faces. Hope I'm not dating myself, but he's always been one of my favorite artists -- I first noticed his art from role-playing games, and then his big splash by creating Elementals. Anxiously awaiting next week for the resolution of the cliff-hanger! Oh, I'm so excited to hear you've been reading for so long!!! You're not dating yourself, that's a lovely compliment, thank you so much. Please comment next week and let me know what you think, it's hardly a cliffhanger but it is nice to hear how much you're invested. Thank you!